Working in wet or oily conditions can reduce your ability to handle objects. 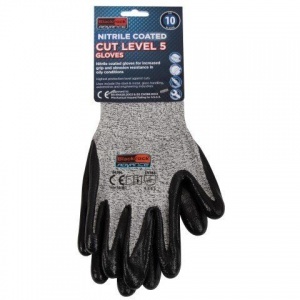 The Blackrock 84307 Nitrile Coated Cut Resistant Gloves are designed with a nitrile coating and blended fibres. These features are resistant against water so your hands remain dry while you work, which allows you to grip objects more easily throughout use. 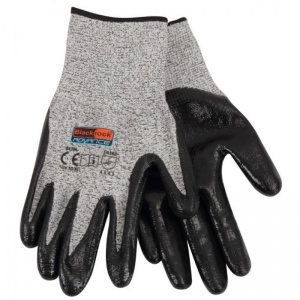 The Blackrock Cut Resistant Gloves product code is 84307. 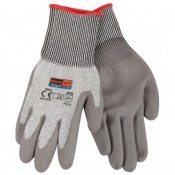 Grey and black in colour, the gloves are ideal for use in a range of different environments. The Blackrock 84307 Gloves have been tested to EN 388. This is the European standard that gauges a glove's resistance to a range of physical threats. Please see the table below for its results. 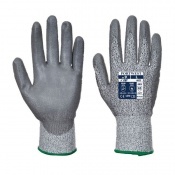 Available in three different sizes, the 84307 Cut Resistant Gloves fit a wide range of users. To find out which size will fit you best, please refer to the table below. Designed with high mechanical strength, the Nitrile Coated Gloves are prevented from tearing even in tough environments. This helps ensure you remain as safe as possible throughout use. 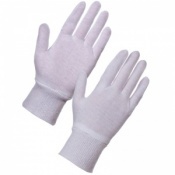 The gloves are not only extremely durable, but they're also highly comfortable. This is the result of their seamless construction.